Arts - Visit South Shore Arts, featuring changing exhibits throughout the year with nationally and internationally known artists, sculptures and photographers. 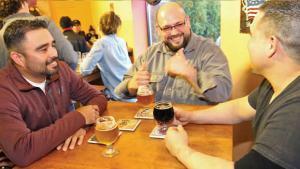 Brewery Trail - Find your new favorite porter, stout, ale or seasonal brew with your friends along the South Shore Brewery Trail. Download the South Shore Brewery Trail App on your phone to start planning your adventure. Cosmic Fun - Grab the kids for a night at SK8 World, a roller rink with an alien/universe theme. Get ready for some throwback family fun with black lights, music, arcade games and snack bar. Dunes - An obvious can’t miss stop is along Lake Michigan to enjoy the sun and sand. Climb the Indiana Dunes and explore through miles of the National and State Parks during your visit. Relax on the beach or walk the trails to spot birds and other wildlife as well as native flower and plant species. Early Bird - Grab your poles this summer and head out to the South Shore’s lakes and rivers. Catch anything from bluegill to walleye and northern pike. From as far north as Lake Michigan and Wolf Lake to as far south as the Kankakee River and Willow Slough, you’ll enjoy a quiet morning along the water. 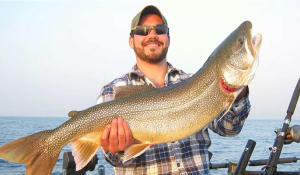 Find the 10 best fishing spots in Northwest Indiana here. Festivals - County fairs, cultural events and more! Pig out on elephant ears or BBQ, meet with artisans and play games at the South Shore’s festivals. Check the events page here for up-to-date things to do. Golf - Not only is the South Shore home to more than a dozen golf courses; but the region boasts the nation’s largest disc golf course at Lemon Lake County Park in Crown Point. Or you can play footgolf at Cedar Creek, combining the skills of soccer with the rules of golf. Both games are fun for all ages! Hotel - Book a hotel for your family and take advantage of a mini getaway close to home. The majority of the South Shore’s hotels offer pools - a great place to let the kids swim and parents relax. Ice Cream - Nothing says summer more than ice cream and the fresher the better! Take a trip to Fair Oaks Farms for outdoor activities, the Adventure Center and reward yourself with a sweet treat in the Cowfé. Jogging and Biking - Stretch your legs along miles of trails. Find trails closest to you or venture out to explore new landscapes. The Northwestern Indiana Regional Planning Commission provides maps of the many miles of trail systems from the Chicago suburbs to the Michigan border. Kayaking - We don’t just pedal in the South Shore, we also paddle. Home to some of the nation’s largest paddling events, you don’t want to miss the opportunity to learn this exciting pastime. 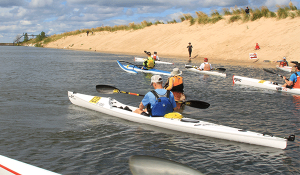 Find out more about kayaking in Northwest Indiana here. Live Music - Northwest Indiana Symphony Orchestra offers free concerts in the park through the summer. Or check out local festivals for live entertainment. Festival of the Lakes in Hammond is a popular summer event with nationally-known music acts performing every night. 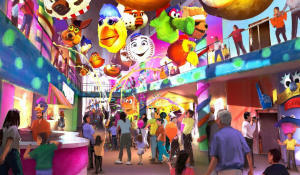 Museums - Opening in 2018, the City of Whiting will open the Mascot Hall of Fame. Stay tuned for updates! Nature - The South Shore has local, county, state and national parks - all for your enjoyment! Pack a picnic and enjoy all that Mother Nature has to offer. Gabis Arboretum in Valparaiso is open to the public and features year-round events, formal gardens and an intricate Railway Garden using model steam trains. 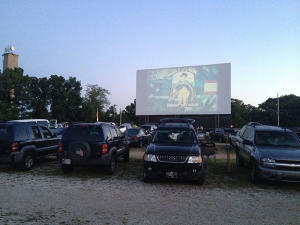 Outdoor Movies - Visit 49er Drive-In Theatre for a fun night under the stars. Also a few of the local park departments host outdoor movies - great for the kids! Find ones coming up on our event calendar. Pig Adventure and Dairy Adventure - Bring the family to the Pork Education Center or the Dairy Adventure at Fair Oaks Farms this summer. 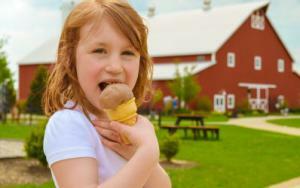 Kids can spend an afternoon learning about farming, view interactive exhibits or enjoy the indoor ropes course. Their Crop Adventure is open as well! Quack - Relax along the shores of Lake Michigan, Cedar Lake, Wolf Lake, Lake George or the Kankakee River to watch the ducks. Don’t forget to pack a picnic for a lazy afternoon by the water. Restaurants - Eat your way through the South Shore restaurants! We have everything from classic BBQ and farm to table experiences to ethnic and white tablecloth restaurants for you, your friends and your family to escape to. 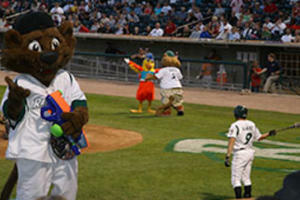 Sports - Take in a baseball game at US Steel Yard in Gary with the RailCats, watch the Deep River Grinders or Munster Centennials play vintage baseball or enjoy playing a game of tennis, basketball, volleyball and more at a park. Theater - Sit back and enjoy a theater performance this summer! Experience “Broadway” right here in the South Shore. Under the Stars - Stargazing takes place at the Indiana Dunes National Park as well as the Conway Observatory at Buckley Homestead in Lowell. See the rings of Saturn, the Perseid Meteor Shower and the Venus-Jupiter Conjunction this summer! Visit Family - Take some time off to visit with your family and friends; better yet, invite them on some of your staycation adventures. 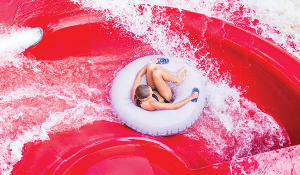 Waterpark - There’s no better way to cool off than at Deep River Waterpark in Crown Point. eXplore - Make it your goal to explore somewhere new or try an activity you’ve never done. We’ve given you A to Z examples of great things to explore this summer! Yurt Rental - Camp in style at Caboose Lake Campground when you rent their waterfront Yurts, single story units with a kitchen area, living area and a bedroom. It sleeps six with microwave, full-size refrigerator, air conditioning, gas grill, picnic table and fire ring. 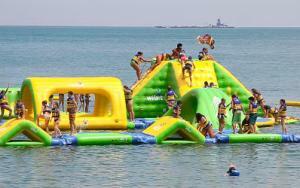 in the "Zone" - WhoaZone at Whihala Beach in Whiting is one of the largest water playgrounds in the Midwest! Climb, slide and splash throughout the one-acre floating water park on Lake Michigan.